Build a modular home that is entirely self-sufficient by providing your own electricity, heating and cooling, water, and waste removal systems. Whether you’re eco-friendly, geographically isolated, a doomsday prepper, or you just don’t like paying utility bills, building a self-sufficient modular home is a great way to stay green, stay isolated, stay prepared, or stay thrifty. Fortunately, the same methods that are used by you die-hards can also help the average modular homeowner. There are four primary needs that need to be met for any home to be considered Self-Sufficient: Generating electricity, heating and/or cooling the home, access to fresh water, and a waste disposal system. Solar Panels can be attached to the roof of your home or they can be free standing in an open area. In some areas, it is even possible to have a company install solar panels on your home for free, though you will then be purchasing the electricity directly from them (albeit at a lower price than you’re probably paying now). Wind turbines can either be free-standing or attached to a home like these. 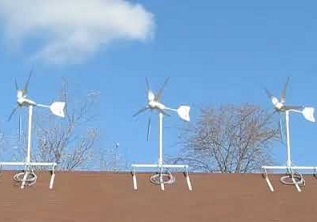 Installing a small, relatively discrete wind turbine on or near your home can usually provide between 1,000 and 2,000 kilowatt hours per year. According to the American Wind Energy Associate, you can expect your system to pay for itself within between 6 and 30 years depending on placement. Installing computer-controlled solar panels that track the sun can maximize the power that you get from your solar panels. Not only does the sun travel throughout the day, but as the image below shows, solar panels should be adjusted based off of the time of year as well. 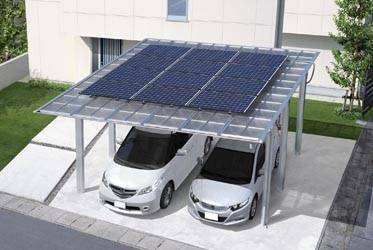 Free-standing garages are better for solar panels since the house will block less of the sunshine. Solar panels can of course be placed on the roof of your modular home, but for the truly die-hard you can also construct an open-air garage entirely. Large wind turbines can be used to generate over 10,000 kilowatt-hours per year (slightly below the average yearly household use), but can be costly to install and requires special zoning permits. A system of this size is likely to cost around $40,000, though depending on where you live, you may end up paying about half of that thanks to renewable energy grants. State and federal grants can help cut the cost of renewable energy considerably, so be sure to ask your builder if there are any available in your area. 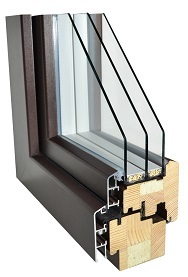 Triple pane windows like these can also be gas-filled for added insulation. Whether you’re greening up a prefab on a sunbathed beach or a snow-capped mountain, well insulated windows and doors are a must-have. If you spend top dollar when you first build your home on double and/or triple paned windows, you will be more than making that money back in energy savings in just a few years. A well-designed HVAC system will feature zone heating and cooling. There’s no reason to heat or cool areas of a home that are not in use during certain times of day. Don’t spend a fortune heating and cooling bedrooms during the day or your living room in the middle of the night. That zone heating and cooling discussed above can be made hard-core by automating the changes in temperature. Special systems can be installed that “learn” what rooms to heat or cool when and can tell when you’re not using them, significantly lowering energy usage. Geothermal heating is still fairly expensive to install and its utility is highly dependent on where you live. Living west of the Rockies for example will make you much more likely to be able to install a Geothermal system at a much lower cost. The system pumps air from your home deep in to the earth where it is either heated or cooled (depending on the season) and returned to your home, giving your home nice climate control with the energy cost of a large fan. Both the die-hards and the everyday home owner need access to fresh water, but getting a water line to your home can be expensive if you live too far off the beaten path. If you have the right soil, you can build a well that will keep your home nicely supplied with fresh water no matter how far you are from current town utilities. Depending on the soil your home is built on, you may be able to construct a septic system that will disburse the waste from your home in to the ground where it will be safely disbursed back to the ground. Septic systems are extremely common and therefore fairly inexpensive. Just make sure the soil is right, or you could end up with a very costly (and smelly) mistake. Previous post: What Is a Modular Home?